I’m back from Chattanooga and I’m as high as a tree in a redwood forest. It would take a fire truck with a really long ladder to get me down and I’m not sure I’d let the firemen bring me down. I’ve gone to Pro Walk Pro Bike before and felt all the passion around me that Susie felt and I submerged myself in it and felt her so close. But this time I came with this really great passion of my own to add to the mix – I talked the Susie Forest to everyone I met at the conferences and on the airplanes. And I came home with between 35 and 40 pledges of trees – Susie Forest beer and pepper bottles really helped. We’ll get those labels on the web site soon so you can doctor your own bottles. The pledges covered a huge area – from Hawaii on the west to Lebanon on the east, from Canada on the north to Puerto Rico on the south. So all of you who pledged, PLEASE plant those trees – the Susie Forest needs them, but especially, the world needs them. 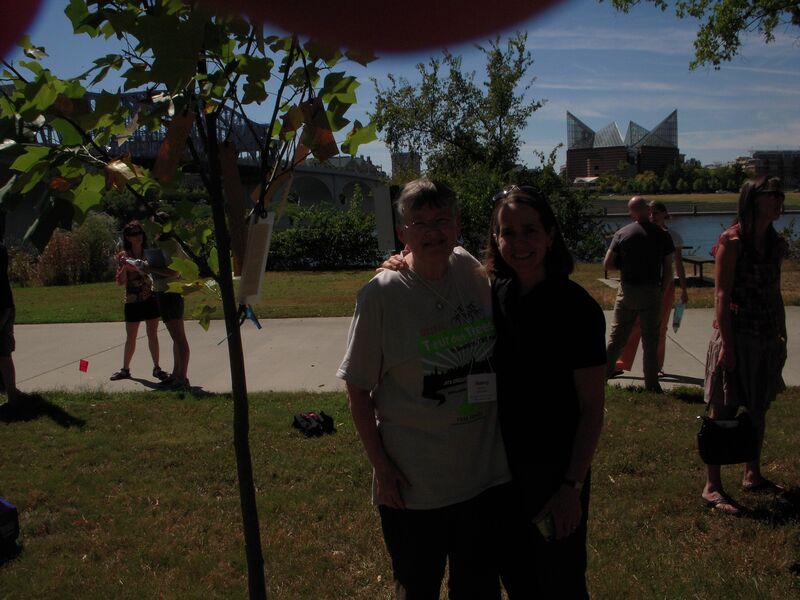 One of the places that I really want to plant a tree is St Louis at the Arch because Susie spent her last evening there. It is a federal park and there are planned changes taking place sometime in the future so I knew there would be problems getting a tree there. While at the conference I went to dinner with a large contingent from Missouri. I told them Susie’s story, showed pictures, and asked for their help. They gave it and 24 hours later they had received an OK from the superintendent of the park. No wonder I don’t want to come down from this high.